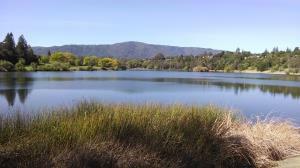 A view of Vasona Lake along the trail, near the dam that created it. Coppertone and I went a bit over 9 miles out and back on the trail today. With the nice weather, lots of other people decided to do the same thing. Lots of walkers, runners and cyclists. We stopped for a few moments at Vasona Lake to watch the ducks in the water. A male and female pair in particular seemed intent on keeping a large number of other ducks from a choice spot in the lake. They were tenacious in their defense of it. Join hikers, runners, bicyclists, and equestrians on some of the Bay Area's finest trails, from Mount Diablo through the Santa Clara Valley and the Santa Cruz Mountains to the Pacific Coast. This expanded third edition provides updated maps and information on park facilities, fees, and regulations. Discover favorite spots while learning about the region's geology, natural history, and wildlife from three of the area's dedicated naturalists and classic Wilderness Press authors.